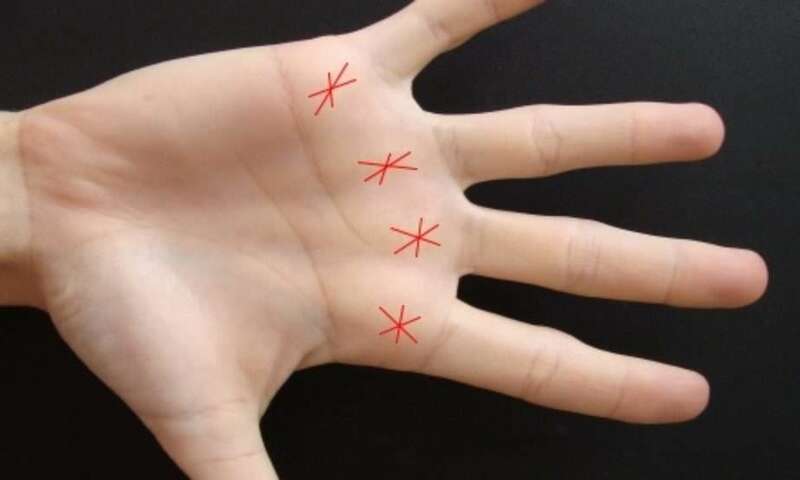 The star lines and markings we see on the palms that don’t seem to fit into any category of a regular line are still significant in a palm reading. They can indicate a warning, such as stress, or point to a sign of talent, fortune or an event. In most cases, markings on the mounts (the padded areas without main lines) accentuate the meaning of the mount either in a favourable or in an undesirable way. Star lines are markings which are both good and bad. On a line, based on traditional meaning, it is an unwelcome find. On the Jupiter or Apollo mount, it reveals extraordinary talent, financial windfalls or even fame. See below for star on Mercury and Saturn. However, even these positive markings need to be viewed as cautionary. Sudden fame or success can influence personal life. That means keeping one’s head together, and feet on the ground to ensure a more secure scenario. Some of these markings will take a careful eye when analysing what they mean due to the difficulty in interpreting whether it is a mix of other lines overlapping or one which stands on its own. STAR LINES – HOW TO RECOGNISE ONE. A star will have at least three lines crossing at the same point and not be made up by other minor or major lines. It is an independent mark on the palm. While most star lines on the mounts are a welcome sign, they come with a complex connotation. The reason could be due to the challenges that are usually involved in the attainment of high-level success or recognition. A star on Mercury mount beneath the pinkie shows a rise in business. However, on the negative side, it can point to dishonesty. A star on Saturn mount beneath the middle finger may depict restriction, confines or obstacles. A mark in the centre of the palm in the form of a triangle is thought to be a sign of scientific aptitude. Some palmists say that it is an indication of unusual aptitude for research. The person usually undertakes interests that pertain to the unveiling of secrets and problems. Next PostNext True Purpose In Life – Do We Need One?